My D and E volume bitlocker encrypted disk.I formatted the computer disk (C). E and D seems to be raw disks.I deleted my BitLocker recovery files. I know Bitlocker password.I have my important data in E and D disc. He has solved the problem.I do not understand how to use this PartitionGuru has. PartitionGuru how the program should I use? 381896001 is the size of the file system. The backup boot is not part of the file system but is directly following, so 381896001 + 1. Leave CHS as they are, they're obsolete and ignored by Windows anyway. Now, we have just found numbers that don't exactly match. No way of telling if fixing this value in the partition table will fix things. I doubt it to be honest. Stands in the way data is encrypted E and D disk. The computer needs to see again BitLocker-protected drive E and D.
And I have to enter my password . 000 33 C0 8E D0 BC 00 7C 8E C0 8E D8 BE 00 7C BF 00 | 3ÀŽĞ¼.|ŽÀŽØ¾.|¿. 016 06 B9 00 02 FC F3 A4 50 68 1C 06 CB FB B9 04 00 | .¹..üó¤Ph..Ëû¹..
032 BD BE 07 80 7E 00 00 7C 0B 0F 85 0E 01 83 C5 10 | ½¾.€~..|..…..ƒÅ. 048 E2 F1 CD 18 88 56 00 55 C6 46 11 05 C6 46 10 00 | âñÍ.ˆV.UÆF..ÆF..
064 B4 41 BB AA 55 CD 13 5D 72 0F 81 FB 55 AA 75 09 | ´A»ªUÍ.]r.ûUªu. 096 26 66 68 00 00 00 00 66 FF 76 08 68 00 00 68 00 | &fh....f.v.h..h.
112 7C 68 01 00 68 10 00 B4 42 8A 56 00 8B F4 CD 13 | |h..h..´BŠV.‹ôÍ. 128 9F 83 C4 10 9E EB 14 B8 01 02 BB 00 7C 8A 56 00 | ŸƒÄ.žë.¸..».|ŠV. 240 43 50 41 75 32 81 F9 02 01 72 2C 66 68 07 BB 00 | CPAu2ù..r,fh.». 001 | 129 | .........0 | ...NTFS | PTE1 | ......2048 | ....202752 | PRI | . 002 | 129 | .........0 | ...NTFS | PTE2 | ....204800 | .498419712 | PRI | . 003 | 129 | .........0 | ...NTFS | PTE3 | .498626560 | .232380416 | PRI | . 004 | 129 | .........0 | ....EXT | PTE4 | .731009024 | .245762048 | PRI | . 005 | 129 | .772244615 | ..FAT16 | PTE4 | 3518184313 | 3851552002 | LOG | . 004 | ..FAT16 | 3518184313 | 3851552002 | 3074769018 | LOG | ... | ..? Doesn't look promising. I suggest you run a megabyte aligned scan, you're not running Windows XP (=pre-vista scan) right? I selected Cylinder aligned (pre-Vista). Now I choose Mbyte -aligned. I will write the result . 000 33 C0 8E D0 BC 00 7C 8E C0 8E D8 BE 00 7C BF 00 | 3ÀĞ¼.|ÀØ¾.|¿. 064 B4 41 BB AA 55 CD 13 5D 72 0F 81 FB 55 AA 75 09 | ´A»ªUÍ.]r.�ûUªu. 128 9F 83 C4 10 9E EB 14 B8 01 02 BB 00 7C 8A 56 00 | ŸƒÄ.ë.¸..».|ŠV. 240 43 50 41 75 32 81 F9 02 01 72 2C 66 68 07 BB 00 | CPAu2�ù..r,fh.». 001 | 129 | ......2048 | ...NTFS | ..BS | ......2048 | ....202752 | PRI | . 002 | 129 | ....204799 | ...NTFS | .BBS | ......2048 | ....202752 | PRI | . 003 | 129 | ....204800 | ...NTFS | ..BS | ....204800 | .498419712 | PRI | . 004 | 129 | .498624511 | ...NTFS | .BBS | ....204800 | .498419712 | PRI | . 005 | 129 | .........0 | ...NTFS | PTE1 | ......2048 | ....202752 | PRI | . 006 | 129 | .........0 | ...NTFS | PTE2 | ....204800 | .498419712 | PRI | . 007 | 129 | .........0 | ...NTFS | PTE3 | .498626560 | .232380416 | PRI | . 008 | 129 | .........0 | ....EXT | PTE4 | .731009024 | .245762048 | PRI | . 010 | 129 | ....174079 | ...NTFS | .BBS | ......2048 | ....172032 | PRI | . 013 | 129 | .133572607 | .NOVELL | PTE3 | .133616127 | .....19049 | LOG | . 015 | 129 | .498626559 | ...NTFS | .BBS | ....204800 | .498421760 | PRI | . 016 | 129 | .731009024 | ...NTFS | PTE1 | .731011072 | .245760000 | LOG | . 005 | .NOVELL | .133616127 | .....19049 | .133635175 | LOG | ..- | ..? nothing is found that can help DiskPatch rebuild a partition table. DiskPatch can't help here. Whatever you did it was thorough, no boot sectors are found and the ones that ARE found do not show signs of bitlocker. Not much we can do here, sorry. Someone has solved that problem . He did what ? I did not understand fully . Fisrt used a another machine and crated a bitlocker partition with windows 7. Just to check how the partition header sector will look like. Then I used a tool that can view the actual hex data. What Has happend was that, when Linux installation couldnt identyfy the beitlocker partition header It agestted that partition and there was a empty sector before the real starting sector. 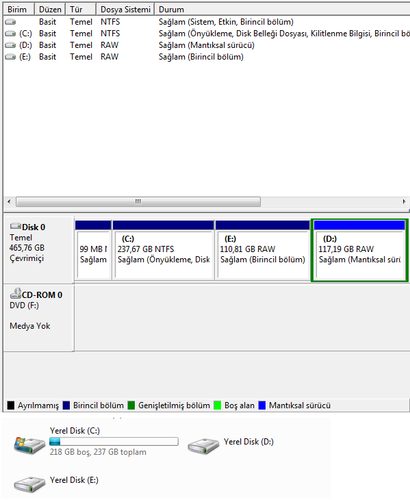 So What we did was edited the first few bits of the partition and make it looks like a NTFS partition. Then use testDisk to edit the partition table and register my partition. restarted, and Vista Showed my partition as a bitlocker encrypted partition. Then, used the Windows 7 installation CD and used its recovery console to unlock the partition. "Then use testDisk to edit the partition table and register my partition. restarted, and Vista Showed my partition as a bitlocker encrypted partition." How was registering disk ? showed bitlocker disk. ? I am sorry but we can't, we don't have the time, to examine all kind of forum threads all around the internet you point to, for free. The thread you initially referred to (on our forum) is a different situation from yours: In that case we DID have boot sectors. In your case we do NOT have boot-sectors for the bit-locked partitions. 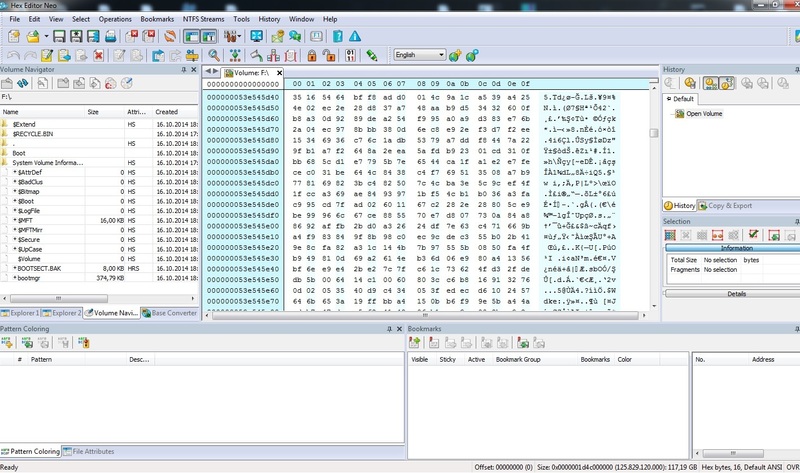 Possibly the boot sectors are there, but we didn't find them using DiskPatch on the expected locations, which turns this into a bit of a wild goose chase. I am really sorry we can't help you. Thank you for your help . In this case How should I follow a path .Recovering raw disk impossible? Does the possibility of rescue ? Has a chance to recover ? According to him, I will search. thanks..
No, there is no chance of recovery here with the tools we offer. Reading a bitlocker volume that is encrypted without the supporting structures can not be done (so iRecover can not help). Without the boot sectors it is over. You can try to contact Microsoft but they will say the same. If we would have the disk here then MAYBE (but probably not, given the damage) but we do not take in disks. So, if our tools and the help we offer with the tools can't fix this, it's finished. My goal is to repair the boot sectors at. Testdisk I did Deep Search with TestDisk. TestDisk complete volume shaped :S:S.
My question is Is it really format ? or just repair boot sectors at it? I'm sorry but I don't understand. I don't know what else to say; we can not rebuild the boot sectors if they are destroyed and were part of a bitlocker volume. 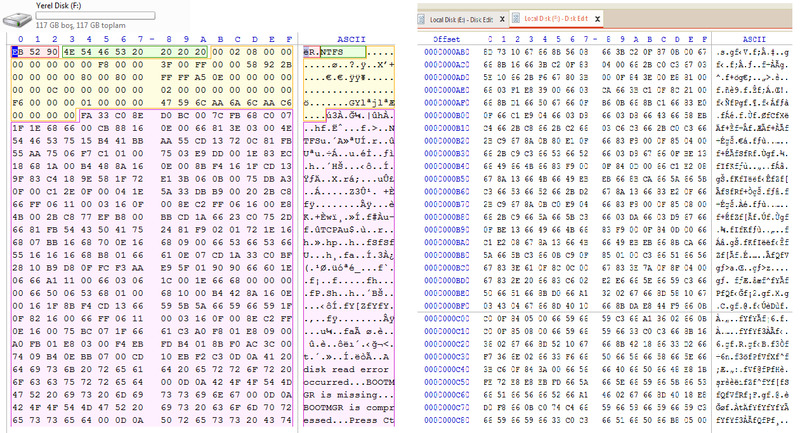 All you can try is to find the boot sector backups, but DiskPatch should have found these and didn't. So I can't help any further. The image on the left shows (part of) a boot sector but I can't make out what it belongs to, the image isn't complete. The boot sector shown though is not bitlockered, so I'm guessing it belongs to the normal NTFS volume at the start of the disk. Do all disc formatting TestDisk scored ? or just repair the boot sector was part ? I wonder if it. I chose only just over DiskPart from the deep search .I think that you just revamped the boot in this sector . still data in encrypted form there? I don't know. The screenshots don't show LBA addresses so I don't know what sector I'm looking at.